The Lillian Anderson Jensen Research Library is the largest research library in the region, named after one of the region's earliest settlers, thought to be the first pioneer child born in Sidney, Montana. 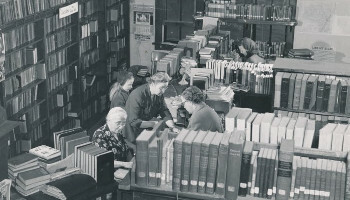 In the library, researchers may access hundreds of reference books, digitized newspapers dating back to 1890, genealogical information, local high school yearbooks, maps, and other materials. Researchers all have access to search the MDHC collections database for photographs, manuscripts, and other records housed in the MonDak archives. MonDak Heritage Center staff and volunteers will conduct research upon request, including genealogical research, historical research, and searches for obituaries. To make a request, please contact us, and include names, exact dates, and locations that will help us search through our resources. We also accept requests by phone or by mail (please enclose a self-addressed, stamped return envelope). The MonDak does not charge fees for research services, but we do ask for a monetary donation to support the continued preservation and promotion of local history and heritage. Please allow up to three weeks of research time, as we operate with a small staff. Some requests may take longer to research.